How can you determine the population size of species? You could count every member of the population. This would be the most accurate method, but what if the individuals in the population move around a lot? What if the population is enormous and requires too much time to count each individual? For example, krill is a small crustacean (usually between 1 and 6 cm long) that accounts for 400-500 million metric tons of biomass in the world’s oceans. Would you want to count all of the krill in the Gulf of Alaska? Often, ocean populations of animals are just too large to count. 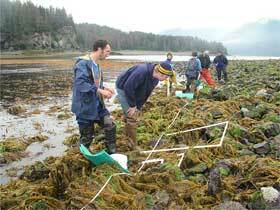 Sampling, or collecting a manageable subset of the population and using the information gathered from it to make inferences about the entire population, is a technique that ocean scientists use. There are a variety of ways to sample. The overall survey area of the pollock study this summer is the northern Gulf of Alaska between the shore and the continental break. Within this area transect lines were established. These are pathways that the Oscar Dyson will travel along and periodically take samples of the fish. The current set of transects are 25 nautical miles apart and are parallel, but transects in other areas may be 2 or 5 nautical miles apart. One nautical mile is equal to 1/60 of a degree (or 1 minute ) of latitude. 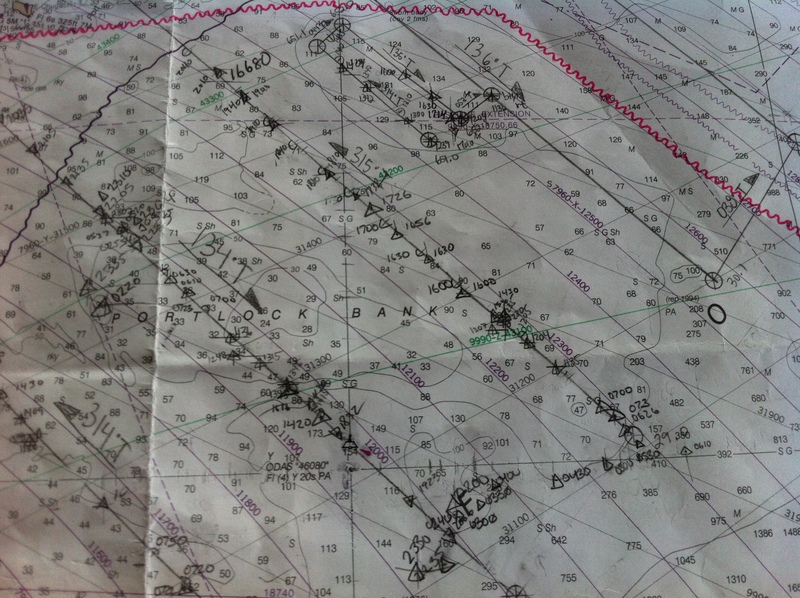 Transects that we are following now are located on the shelf and are perpendicular to the coastline. Transects in inlets and bays may run differently, perhaps even zigzag. If fish are located through acoustics monitoring off the transect line, the ship might break transect (a mark is made on the map), circle around to the desirable position, and collect a sample by trawling. The population of pollock can then be mathematically calculated from counting the sample. 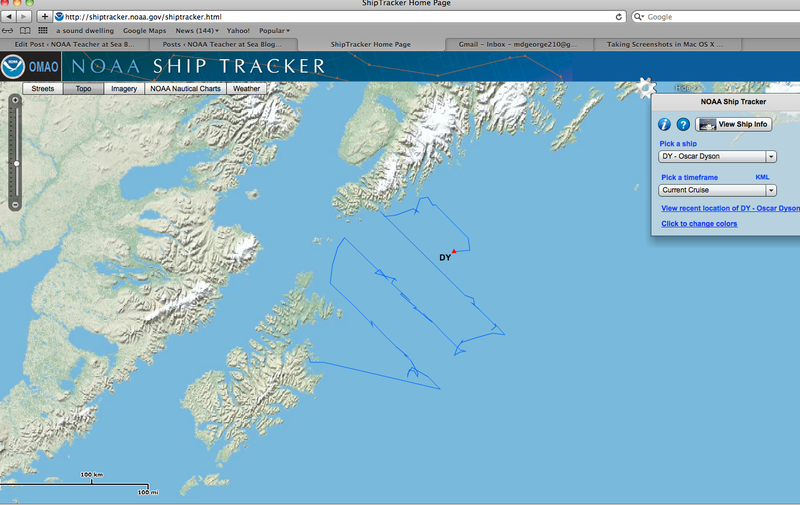 After trawling, the ship will return to the break and continue along the transect line. Most days, scientists hope that the Oscar Dyson will finish a transect line by nightfall and then the ship can be at the next transect by sunrise. This maximizes the time for detecting fish acoustically and trawling to collect samples. In his 1943 paper “A Theory of Human Motivation,” Abraham Maslow, a developmental psychologist, proposed a hierarchy of needs which focus on describing the stages of growth in humans. 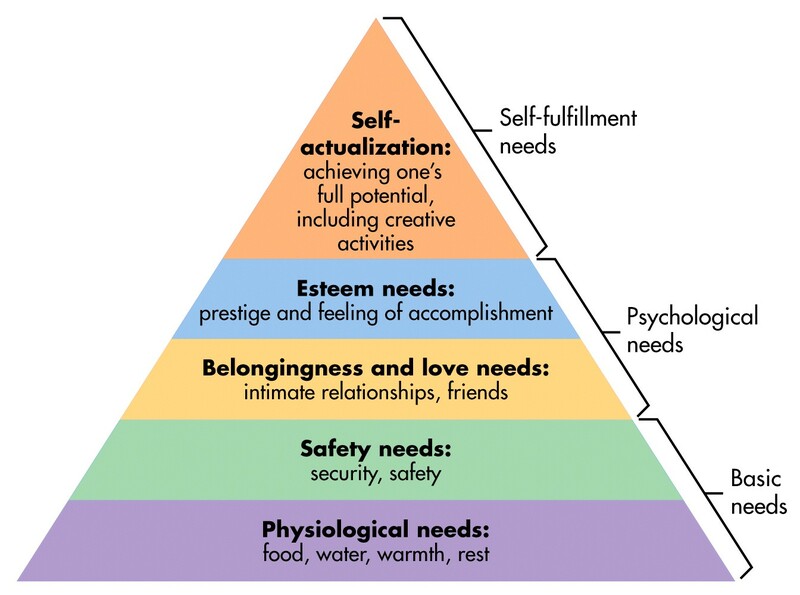 The largest, most fundamental needs are at the bottom, and as those are satisfied, individuals are able to progress up the pyramid. So, I am going to use this diagram (somewhat tongue-in-cheek) to discuss how basic needs are met on the ship. In today’s blog, I will begin the discussion at the bottom level (where else?). The bottom layer includes the most basic physiological needs one requires for survival: food, water, warmth, and rest. (We might also include exercise in this level). So, let us begin at the beginning. Water is needed for in several capacities on the ship. 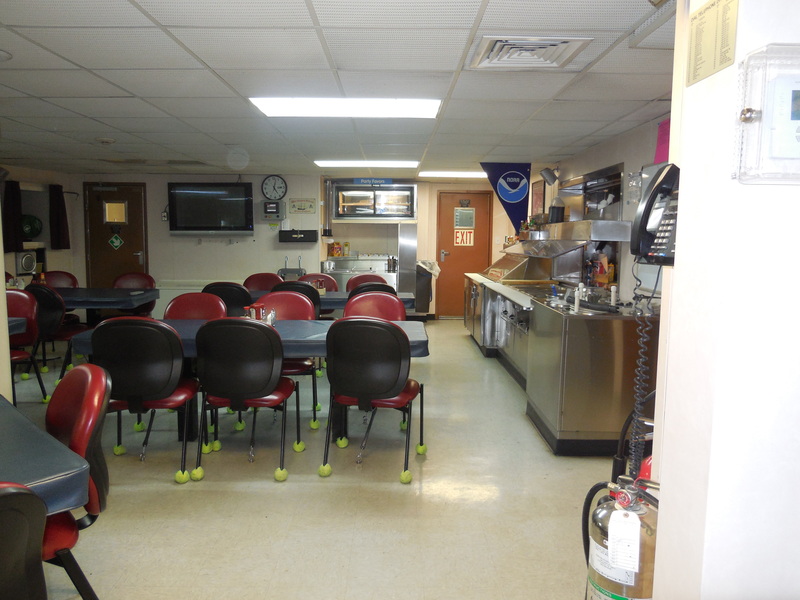 The staff on the ship needs potable water to drink and to cook with. 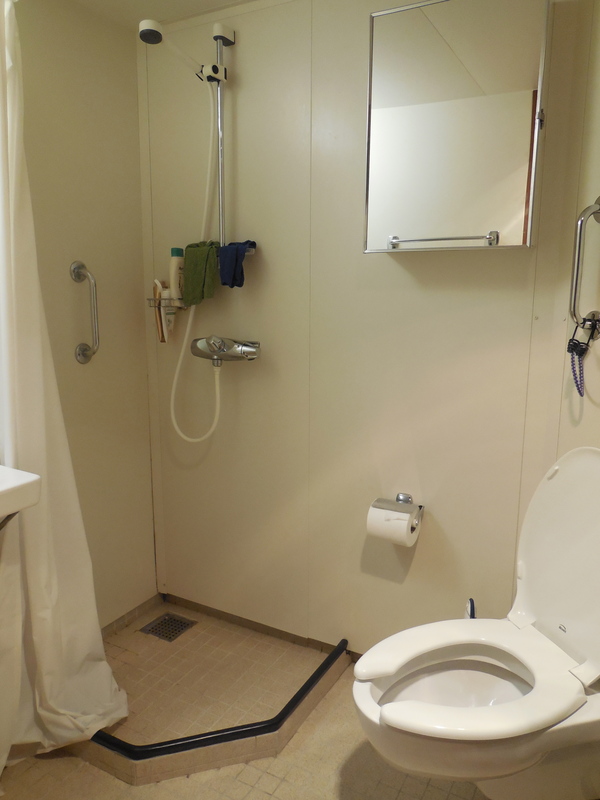 Additionally, water is needed for washing dishes, bathing, flushing toilets and doing laundry. To get clean drinking water, we pump the salt water from the ocean into a desalination unit (a distiller). The distilled water is then sent to a 10,000 gallon holding tank. When water is needed, it is pressurized so that it will move to the faucets, drinking fountains, showers, and so on. Water is also needed on the ship in the lab and on the deck to clean up after the catch is hauled in and processed. The water used here is salt water and is pumped onto the boat directly from the ocean. There are two workout areas on the ship. 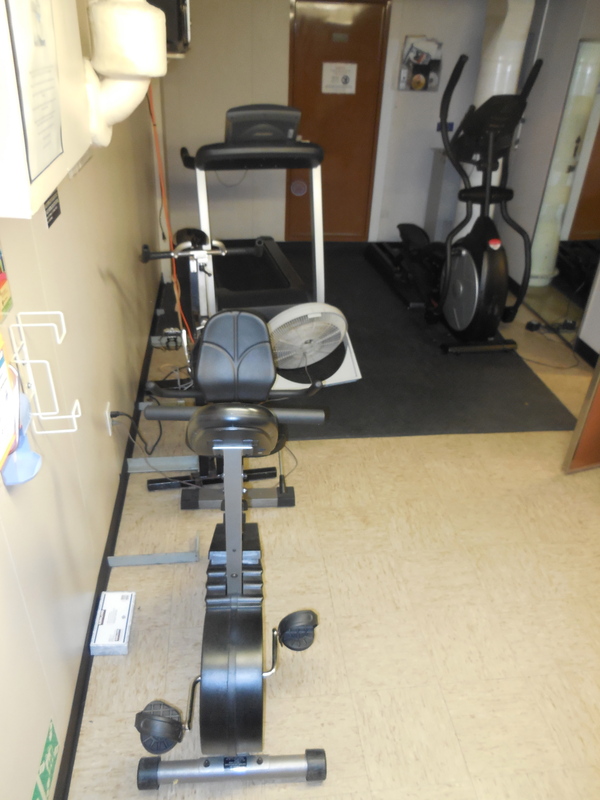 One workout area has a treadmill, an elliptical machine, a bike, and a yoga mat; the other has a treadmill, a rowing machine, and some free weights. 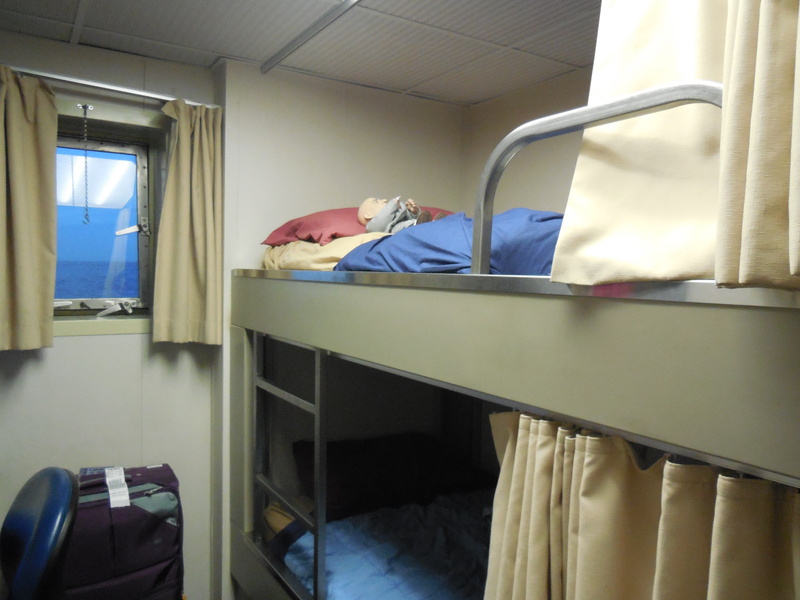 There are limited walking spaces on the ship, so these machines provide a way to stretch one’s legs, so to speak. With a bachelor’s degree in science, math, or engineering and a 6 month training program at the US Coast Guard Academy in New London, CT, one can serve the United States as a member of the National Oceanic and Atmospheric Administration’s Commissioned Officer Corps (NOAA Corps). Members of the NOAA Corps serve as operational experts, taking researchers to sea and helping to generate environmental intelligence. My roommate, Abby, serves as a member of the NOAA Corps. 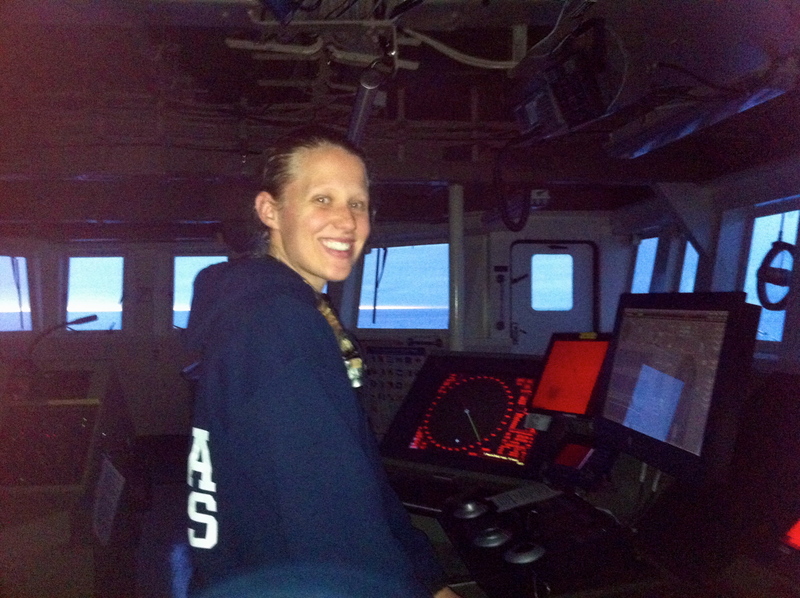 This is Abby’s second cruise with the NOAA Corps. She has a bachelor’s degree in chemistry and just completed her NOAA officer basic training. One of her tasks is to be ready to deploy specific measures in case of a fire on board. 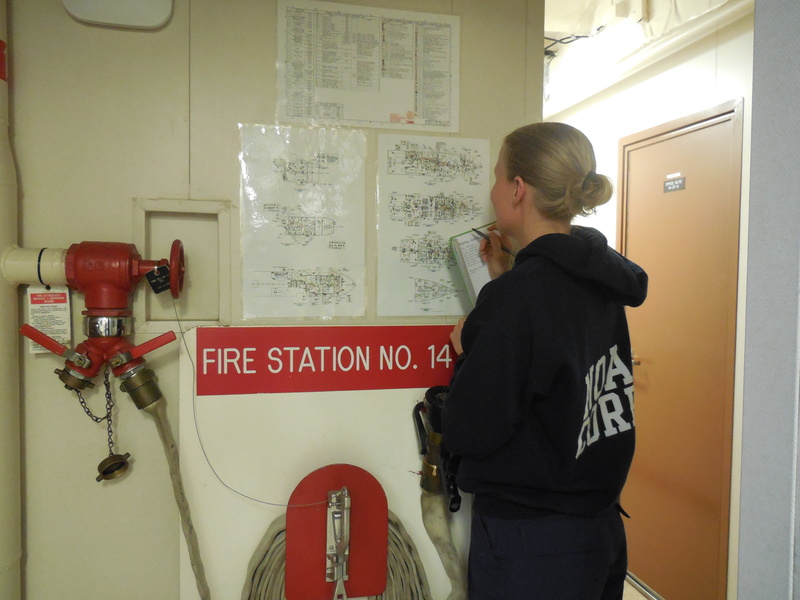 Below, she is reviewing all of the locations on the Oscar Dyson with fire response equipment. For more information on NOAA Corps, click on the link. Knowing geography is essential to various positions on the ships such as scientific exploration and navigation. Many types of maps are seen on board, for example, computer generated bathymetric maps show the contour and depth of the ocean. 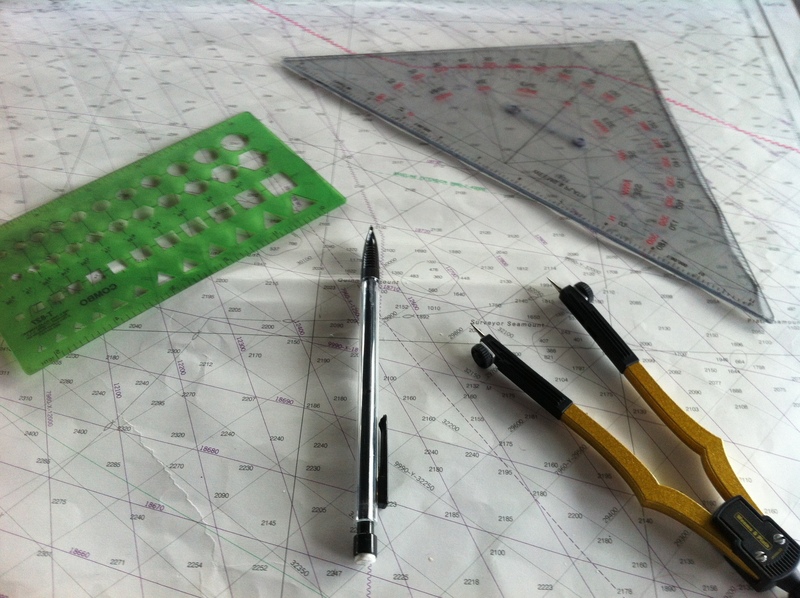 Equally valuable are the “old school” tools (paper maps, compasses, straight edges, and pencils) used to plot the ship’s course. Etymology is the study of the origin of words. Many of the words in science originate from ancient languages such as Greek or Latin. For example, the word etymology comes to us from two Greek words: etymon meaning “the true sense of a word“ combined with logia meaning “doctrine, study.” Combining these two roots gives us “the study of the true sense of words,” which can be said to be the meaning of the word etymology. 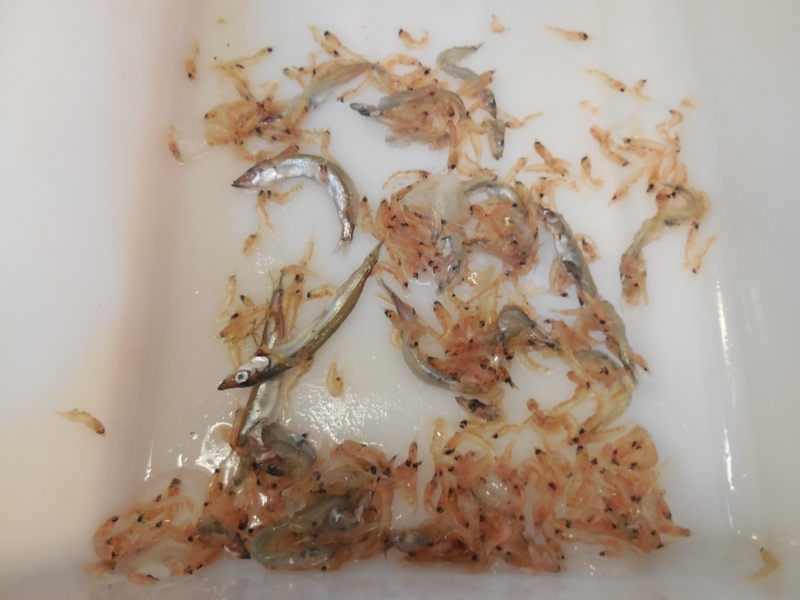 In the blogs thus far, I have discussed two species: walleye pollock and one of their prey, krill. Krill are classified as zooplankton, literally “animals that drift. ” Krill eat phytoplankton, or “animals that drift.” Pollock are considered to be zooplanktivorous, or “drifting animal eaters.” An award winning short video explaining The Secret Life of Plankton can be viewed by clicking on the link. This entry was posted in 2013, Melissa George, NOAA Fisheries Service, NOAA Teacher at Sea and tagged Alaska, drinking water, gulf of alaska, Melissa George, National Oceanic and Atmospheric Administration, NOAA Corps, Oscar Dyson, sampling, Stateroom Tour, transect lines. Bookmark the permalink.